Vanessa: I’m the first to admit I have a weakness for furnishings and homewear of any kind (an obsession I share with Alex, with our mutual appreciation for cutlery and plates) so a cafe adjoining Coco Republic was always going to be right up my alley. Team FFS, along with our honorary fourth member Mr M, gathered one Saturday morning at L’Americano Espresso Bar in Alexandria. Whilst the possibility of walking into Coco Republic and walking out having made a purchase is only in my dreams, the adjoining cafe offers a good menu choice at fairly reasonable prices. We arrived and were greeted by the friendly manager, Tom, and true to form the cutlery and plates immediately had Alex and I swooning. The decor and furnishings are aligned with the opulence of Coco Republic and the wall of Italian boats plays homage to the Italian Riviera. We were brought a round of coffee whilst we perused the menu and I was pleased to see that their coffee of choice is Vittoria, which happens to be in my top 3 preferred brands of coffee. Head Chef Alessandro Gandolfi, has created a menu that offers Italian artisanal dishes from locally sourced produce. We chose a range of dishes from both the breakfast and lunch menu, both of which are served all day. Due to the sizeable serving boards and plates (not to mention our tendency to over order) we had to move tables to accommodate our meals. The Chef’s Tasting Plate ($48) is made up of 6 crostini which is a traditional Italian open sandwich served on organic ciabatta. The toppings are varied and are a mix of meats and vegetarian options. It is a great choice for sharing and each crostini differs from the other so you get a good selection that caters for a all tastes. I chose the Charcuterie board ($24) from the antipasti section of the menu and was so pleased I did. I was impressed with the generous serve of cold meats, cheeses, fruit, bread and side of honey. 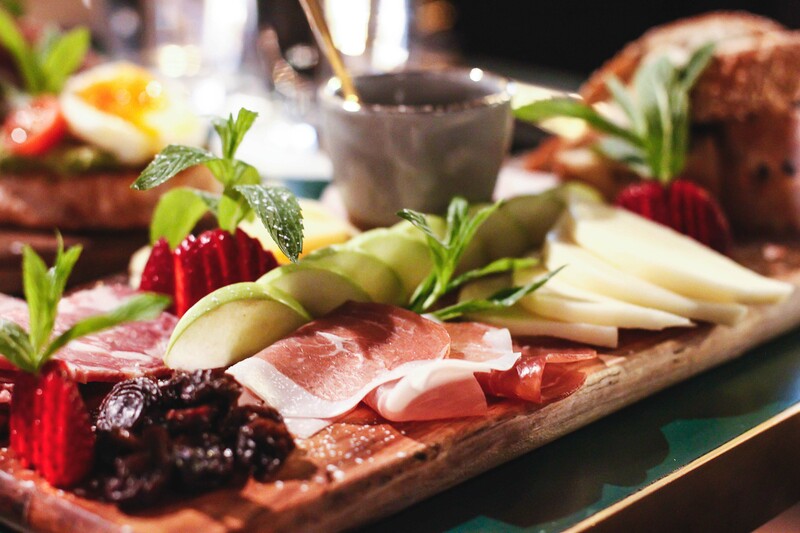 Beautifully presented, the charcuterie board is another good option for sharing and really great way to graze during a meal. The prosciutto and avocado toast ($12) is a good staple option and the prosciutto adds a bit of gravitas to the standard and oh-so-hot-right-now avocado smash. Served on toasted organic bread and drizzled with olive oil, lemon and thyme this is a safe and satisfying dish. Similarly the focaccia ($12) served with mozzarella, prosciutto and basil was a tasty and simple offering for breakfast or lunch. There were a lot more offerings from the savoury menu we would have chosen, such as various egg dishes and granola, but alas we all know that Team FFS has a penchant for sweets so room had to be made. I had a real hankering for pastry that day and Tom kindly brought us a selection of croissants and cronuts from the daily selection of sweets. Crispy, buttery and flaky both of these sweet options are the perfect treat to round off with another coffee. We were so full that we had a bite each and packed the rest up to eat later. The real tragedy is that our “doggie bag” was then accidentally left in Coco Republic (by yours truly) clearly I was distracted by the beautiful furnishings!! window or otherwise, this is a great fixture of the Alexandria cafe scene. A relaxed setting, delightful decor and artisan dishes make it an ideal location for a casual breakfast or lunch. *ForfoodsSake dined as guests of L’Americano. All opinions however are our own. Special thanks to Tom for his hospitality. The croissants and cronuts look so delicious!! Looks like the cronut was cut in half and filled?